With March just around the corner, the winter boat show season is starting to come to a close – some will welcome this news with open arms, as it means we can now start thinking about actually using these boats up north, or at least getting ready. 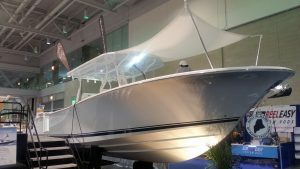 Between Southport and our dealers, there were boats on a display at no less than 6 shows between New Years and the end of February, in places like Boston, NYC, Baltimore, Virginia Beach, and Charleston, SC. As is usually the case, the big flare of the 33 attracted a lot of ohhs and ahhs, the size of the boat really standing out when sitting on stands and blocks inside a convention center. At a few shows, the most common question was “how big is this boat?” and followed up with guesses of anywhere from 34 to 40 feet. The beam of the Southport, which it carriers far forward unlike a lot of other center consoles, really makes the boat feel bigger than she is. This is true of the 33 for sure, but also of the 272 and 292.
the brand new 33 featured a mezzanine style seating layout on the back of the leaning post. 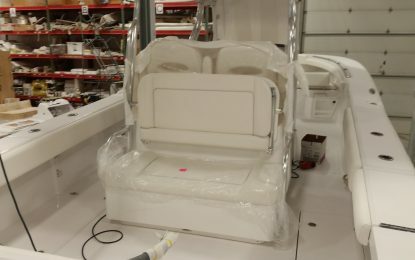 This design really opened up the already spacious aft cockpit and makes the boat a true all-star for both fishing and “creek cruising” as they call it. If you’ve never been to a show and seen Southport, you owe it to yourself to see them in person. The style, fit and finish, and beauty of the boats in person is striking. The next big show for us in West Palm Beach, with numerous local shows between now and the start of the season in the north. You’ve still got time to get yourself a Southport for this summer. See the Events page for all of your local shows.